Faced with the assertion that traditional masculinity leads to patriarchal structures in society and in relationships, men have been experiencing increasing conflict about their desires for sexual and social strength and generative power. 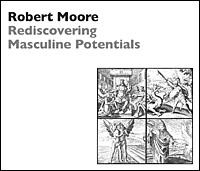 Archetypal images provide a vision of a new masculinity that will nurture strong and caring men. In examining the archetypal foundations of mature masculinity, Dr. Moore discusses the King, the Warrior, the Magician, and the Lover. He lectures and leads discussions on the potential imaged by each of these archetypes and the shadow manifestations that occur when these images remain unconscious and acted out.